A new state of the art heritage room, designed to showcase The Grange charity’s historic collection of needlework and its fascinating connection with the royal family has been opened to the public for the first time today. The new facility, located in The Grange’s Victorian main house in Bookham, has been funded by a £97,500 grant from the Heritage Lottery Fund (HLF) and tells the story of the charity’s beginnings as The School of Stitchery and Lace, which was first founded in 1938, to its current role as a charity supporting people with learning disabilities to lead independent lives. 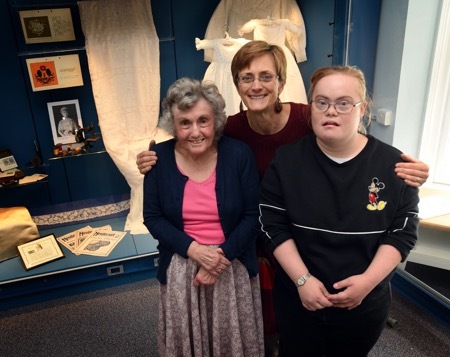 The project has involved carefully preserving the charity’s historic collection of needlework, which includes embroidered items made for the Royal family, photographs, letters and books. There are numerous letters between The School and royal households which give a rare insight into palace life at the time. One of the letters is from Queen Elizabeth’s nurse ordering a copy of a dress and there are also hand-drawn designs for Queen Mary’s nightgowns. It will receive an official opening from royal patron, HRH The Duke of Gloucester, on 25 September 2018.